This piece is a sample chapter from the book Creating the Productive Workplace: Places to Work Creatively, now available to order. However much we know about the forces we expect to come into play in our time and however much we understand the various social, commercial, legislative, cultural and economic parameters we expect to direct them, most predictions of the future tend to come out as refractions or extrapolations of the present. This is a fact tacitly acknowledged by George Orwell’s title for 1984, written in 1948, and is always the pinch of salt we can apply to science fiction and most of the predictions we come across. This is the fundamental reason why a typical report or feature looking to explore the future of work and workplaces invariably produces a hyped-up office of the present. This has sufficed to some degree up till now because the major driving force of change – technology – has developed in linear ways. Its major driver since Gordon Moore produced his eponymous law in 1965 has been miniaturisation. If we can expect computing power to double every 18 months, as Moore predicted, we at least have a degree of certainty about technological disruption. Of course, this has already had a profound effect on the way we work and the way we use buildings. So too has the secondary prime technological driver of the early 21st Century, the digitisation of the past and present. We are no longer faced with an era of linear miniaturisation and digitisation, but one in which a number of technological forces coalesce to create a perfect storm of uncertainty. For each of these, there has yet to emerge a consensus about the nature of the technology itself and its implications for the world, so the idea we can predict with any certainty what will happen in the eye of the hurricane is fanciful at best. Even if there were a general consensus about the implications of specific new technologies, it would likely be out of date before this book had a chance to garner even the thinnest layer of dust. But we must be aware of them and gauge their implications for commerce, society, philosophy and the economy. Eternal vigilance is not just the price of freedom but is now the price of living in the 21st Century. There are a number of specific challenges that this creates for those who work in the fields of office design, architecture, commercial real estate, facilities management, human resources and what IT and all the myriad disciplines and professions involved in the chimera we now call ‘workplace’. The most important is one that has been around for a very long time and it is how to resolve the tensions created by the different speeds and life cycles we might attribute to the facets of the workplace. In particular, because the way we work changes so quickly, buildings need to have flexibility built into them so that they meet our needs today but anticipate what we will need tomorrow. In his book How Buildings Learn, Stewart Brand outlines the process whereby buildings evolve over time to meet the changing needs of their occupants. He describes each building as consisting of six layers, each of which functions on a different timescale. These range from the site itself which has a life cycle measured in centuries, through to the building (decades), interior fit out (years), technology (months), to stuff (days). 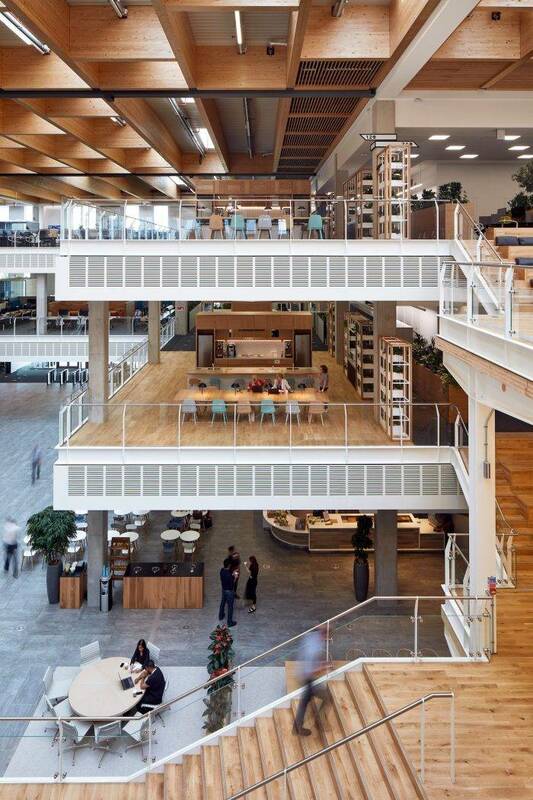 The effectiveness of a workplace design will depend on how well it resolves the tensions that exist between these layers of the building. The principles behind this complex situation have been known to us for a long time, at least since the 1970s when Frank Duffy first introduced the world to his ideas about the physical and temporal layers of the building – in his terminology the ‘shell, services, scenery and sets’. The balance between these layers may have shifted significantly in recent years, but the tensions between them continue to determine how well we design and manage our workplaces. While the nature of work has already changed in many ways, the pace of change has increased even more dramatically over recent years and we still ain’t seen anything yet. So the challenge is how best to manage change, keep costs down and provide a flexible home for the organisation so that whatever happens in the future, we can at least meet it with a degree of confidence. Successful management of change is a good thing, an agent of growth and commercial success. Change handled badly can hamstring an organisation. The standard answer to the challenge is to build flexibility into the building. At the property management level, this may mean a change in contractual terms, notably in the length of leases, and the provision of lease breaks. Varying levels of flexibility must also be apparent through the rest of the building in terms of its design and management. If we take an idealised view of the modern office as a flexible, social space for a peripatetic, democratised and technologically literate workforce, the solution lies in an increased use of desk sharing, drop in zones, break out space and other forms of multi-functional workspaces. 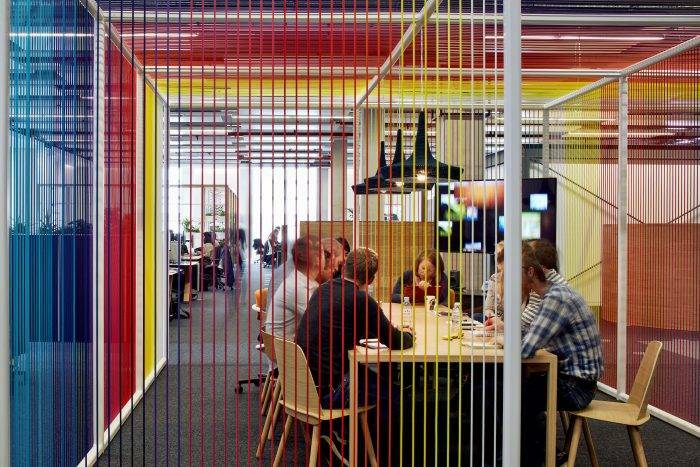 In many offices individual workspace is already being rapidly replaced by other types of space, quiet rooms and collaborative areas. 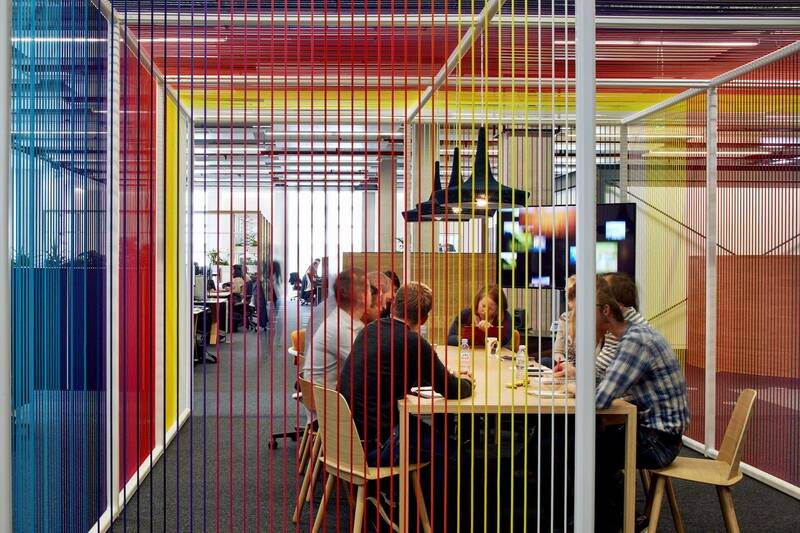 Flexibility must be hardwired into the building at a macro-level. Not only must floorplates be capable of accepting a wide range of work styles and planning models, servicing must be appropriate and anticipate change. That doesn’t mean just in terms of technology and telecoms but also basic human needs such as having enough toilets to deal with changing occupational densities. It also means having a HVAC specification that can deal with the changing needs associated with different numbers of people and different types of equipment. Elements of the interior that were once considered static are also having to offer far larger degrees of flexibility including, furniture, lighting, storage and partitions. This issue of flexibility has become more important within interior design. Interior elements should now define space, portray corporate identity, comply with legislation and act as an aid in wayfinding. They must do all this and be able to adapt as the organisation changes. Yet all of this is still only scratching the surface of the issue. It’s not exactly cosmetic and it will apply to a far larger proportion of the office market than many workplace futurists would lead you to believe, but it is not exactly game changing. That will happen elsewhere and will involve a complete rethink of the way we view work and workplaces. This presents a particular challenge for the various workplace disciplines because they’re still clinging on to both their own established ideas and the demarcations they think still apply. At some level, they’re aware that the gig is up, which is why you’ll see trade associations toying with allegiances with others who have overlapping interests. It’s why commercial property firms are moving into the fit-out market. It’s why the major technology firms are moving into new realms in the physical world such as the Internet of Things and driverless vehicles. 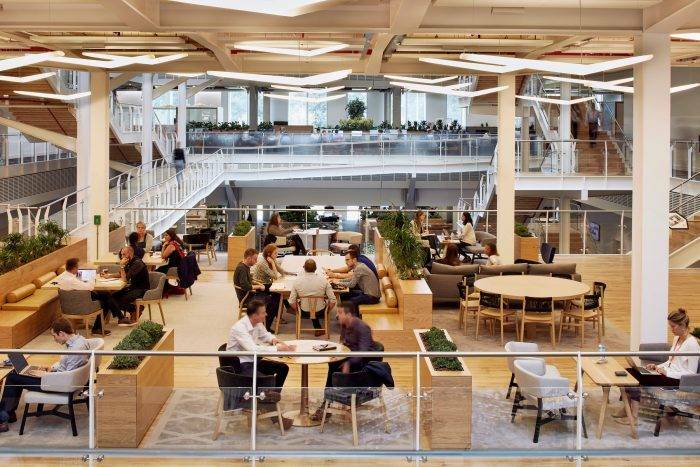 It’s why coworking spaces are coning to dominate the commercial property markets in the world’s major cities. It’s all a sign of an upcoming great reckoning which will see the creation of a new order for the workplace. There will be casualties, especially amongst those organisations who can’t grasp the enormity of what’s about to happen and so will drown in the imminent technological immersion. Trade associations are still hankering for a place at the boardroom table unaware of or unwilling to admit to the fact that their immediate priority should not be status, but survival. They still view Big Data as a way to build their case, not as part of the wave of technology that is about to fall over their heads. We can already see the first signs of how this may play out. The way we work has changed profoundly in a very short space of time. In the UK, more than half of employers now offer some form of flexible working according to The Work Foundation and there are calls for it to become the norm for everybody in employment. It already is the norm for the 18 percent of the UK population who work in the gig economy, a catch all term that does not do justice to the range of working types it incorporates, ranging from the pickers and packers of the precariat to freelancers and the self-employed, including the rapidly growing number of those who make a good living on their own terms in the creative and digital industries who are almost certainly the main agents of change. The Government appears to have little grasp of the people who work in this world, often confusing them with traditional small business and aggressively wary of their tax arrangements. This is the group of people who are doing most to drive the uptake of coworking, which is almost certainly the key office phenomenon of this decade. They, understand the need to be around other people, but only at certain times and for certain tasks. They have no need of a corporate office, a commute and a routine day. They certainly don’t need to pay the huge rates now demanded for the best office locations next to the larger firms with which they would like to work and they don’t want or need a lease that will outlive their next business relationship and possibly their business. This is a fundamentally different mindset in which offices are consumed and experienced, not owned or leased. And we need to get used to it, especially because the idea experiential office will soon follow in the wake of coworking and cross into mainstream thinking. The office isn’t about to die, as we’ve been hearing for way too long now. But it is going to transform into something else entirely. What will happen beyond the next few years is anybody’s guess and we’d be foolish to predict it. What we can say is that we are set to address some key questions about how we relate to the world and to work and we are going to have to make some very difficult decisions. For example, sometime in the near future we’re going to have to address the issue of how we introduce a basic income for people in response to a changing world in which many of the current tasks we do will be carried out by robots, freeing us to do other things and work in new ways. This will happen sooner than you might think. Earlier in 2016, the World Economic Forum said that the so-called Fourth Industrial Revolution would result in 5 million job losses in the 15 countries it surveyed by 2020 and that this was merely a pre-shock for the seismic changes to follow. Meanwhile the Government still appears to think that the past is a guide to the future. In the Spring of 2016, the newly formed Infrastructure and Projects Authority published its construction strategy paper for the period up to 2020. By definition the department is responsible for planning and creating the UK’s infrastructure for decades beyond that time and yet the document only uses the word technology three times and, even then, only with regard to the application of BIM as a way of improving the construction process. Perhaps more worryingly, the very short section at the end of the document on whole life approaches only deals with the issue of sustainability. It makes no mention of creating the physical infrastructure capable of dealing with a rapidly changing world. We make the same mistake when we consider our own place in the world. We humans assume that we are somehow at the apex of the evolutionary tree when the truth is that we are transitional forms in exactly the same way as all other creatures. We don’t need to seek the missing link, because we are it, and always have been. Most educated people are aware that we’re the outcome of nearly 4bn years of Darwinian selection, but many tend to think that humans are somehow the culmination. Our sun, however, is less than halfway through its lifespan. It will not be humans who watch the sun’s demise, 6bn years from now. Any creatures that then exist will be as different from us as we are from bacteria or amoebae. Images: Sky Central designed by Hassell. Photographer Mark Cocksedge.